On page 64 of H&F Council’s newly proposed Local Development Framework (LDF) it says “Hammersmith Town Centre is the preferred office location in the borough and the Council will encourage major office based development”. One reason that sentence is in the LDF is they have to justify the Conservative Administration’s highly dubious plans for a new Town Hall office complex and supermarket. Intrinsic to their proposal is the demolition of the cinema, shops and many local homes. My Labour Colleagues and I campaigned against this awful scheme at the last local elections. We made a manifesto commitment to stop it should we have won a majority on H&F Council. We didn't. But many local residents, of all political persuasions, are also up in arms about it. They, quite reasonably, argue it will blight Hammersmith and damage the quality of life in the area for many years to come. Save Our Skyline is a new, non-political residents' group that has support from all the leading residents’ associations. They have arranged a public meeting so residents can hear more about H&F Council’s plans for our neighbourhood on Wednesday, 13th October 2010. The meeting will start at 7.00pm and will take place at Rivercourt Methodist Church, King Street, Hammersmith, W6 9JT. I would urge you to attend. Going by the photos, the Town Hall development will leave Hammersmith looking like Basingstoke’s oddly ugly sky line. It is important to also note that it will cost local tax payers at least £35 million. So it isn't only the landscape likely to be blighted by H&F Conservatives' plans. As long ago as March 2008 Cllr. Mark Loveday (Con), H&F's Cabinet Member for Strategy, flew to Cannes on the French Riviera to meet property speculators. He returned again the following year. The official explanation for these trips was that he and his team were having secret meetings to discuss "contentious development sites" in the Borough. He has refused to tell us what was discussed or agreed. 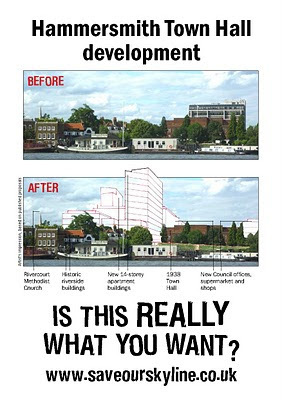 However, we do know that H&F Council has caved in to developer’s demands to make the buildings much taller and at a much greater density than the Council originally proposed. It is important that H&F Council is able to demonstrate that it is taking the concerns of local residents seriously in its private meetings. This does not appear to be the case. In fact, rather than being open with the public about its relationship with property speculators, this Administration mislead residents objecting to previous "contentious" developments. So, this time, H&F Council must be prepared to make public who it's been dealing with, how often it's met them and what it has been saying and agreeing about this highly controversial site. Take a moment to also consider that H&F’s Conservative Administration is set to grant further planning permission for two new super-sized office blocks at the bottom of Hammersmith Grove, that they are hoping to knock down and rebuild Shepherds Bush Market (and the surrounding shops), they plan to stick a another giant complex on Hammersmith Embankment and, on top of all of this, they want to demolish people's homes on Ashcroft Square and the Queen Caroline Estate. It seems fairly conclusive that H&F Conservatives' short terms plans for Hammersmith involve making it one of the biggest building sites in Europe. My fellow Labour councillors and I oppose these schemes as do many residents. I will detail why later. 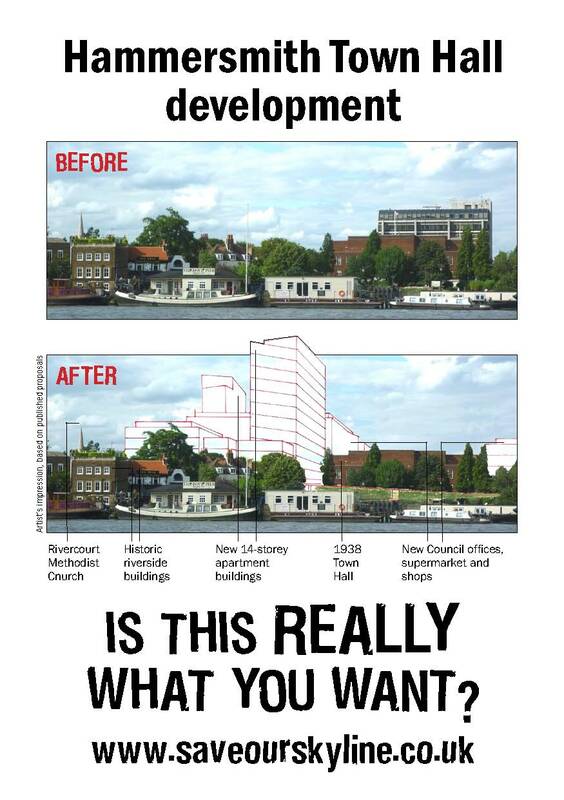 For now, please take a look at the Save Our Skyline website for more information. Please click here if you want to sign their petition. If you'd like to put a protest poster in your window, you can click on the attached photo to increase its size and print it off. You can email Save Our Skyline directly by clicking here. Over fifteen residents' and amenity groups are objecting to the Council's plans now that they have seen Save Our Skyline's drawings of what the development will really look like. It's huge, it's high, it's ugly, it's designed to profit the developer and dispossess tenants from the Pocklington flats. It will dwarf the 1930s Town Hall that the original Council design brief intended to complement. Come to the public meeting next Wednesday, 13 October, 7pm at the Rivercourt Methodist Church. This evening the Ravenscourt Park ward councillors Lucy Ivimy, Harry Phibbs and Charlie Dewhirst are holding their monthly "surgery" at 7pm at the Grove Neighbourhood Centre, 7 Bradmore Park Road. As the saying goes - on their track record so far, the Conservatives (and apparently their officers) have never met a property developer they didn't like.